Users will be able to browse content by production house and franchise -- Disney, Pixar, Marvel Universe, Star Wars and National Geographic were shown in the screenshot -- as well as system recommendations. 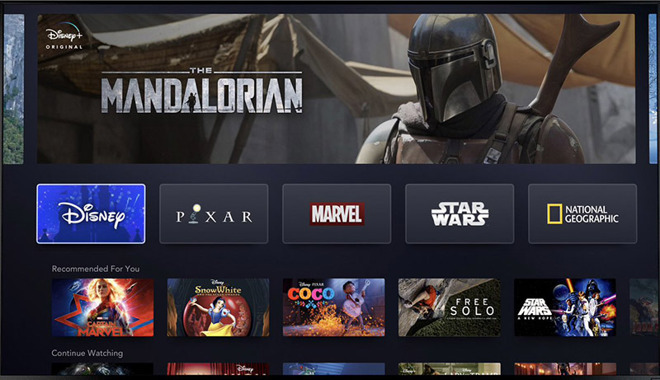 While not displayed in the image shared by Iger, Disney+ incorporates big-name movies and shows from Disney's recent $70 billion acquisition of 21st Century Fox. With this announcement, it appears that Apple TV+ and Disco now share the same future. You mean Dead Very Soon? Like Apple watch? Iphone in 2007? and Ipad? So while Netflix probably yawned at the Apple TV+ announcement, Disney+ certainly worries them. Additionally, this puts a boundary price on Apple TV+. I'm still curious about Hulu's future. Doesn't Disney own 51% of Hulu through its 20th Century Fox acquisition (I think it owned some % before and that % increased with the acquisition)? Disney currently owns 60%, Comcast owns 30% and AT&T owns 10%. Disney+ at $7/m or $70/y is a pretty good deal. Since Disney doesn't have to pay any licensing fees for content that puts them one step ahead of everyone else on their overhead. No one wants Apple to buy [insert company name here]. Especially not Disney. Math doesn't support that idea being good at all. Netflix only worry is Disney has been pulling its content off their service for this. It might take a dent, but Netflix isnt likely going to take a major loss by this. Apple TV+ will haft to be between $7 and $13 to be practical, that was already known, thought it might influence Apple to drop the target price a $1, though I doubt that since Netflix continues to raise its prices. Hulu might be losing some of its content as well to the Disney service, but as long as its relatively popular I don't think it is in any real danger. Apple should most certainly not buy Disney. Disney buying a bunch of companies and covers a series of things from theme parks, toys, tv channels, movie franchises, etc. Not a single thing to do with computers which is what Apple deals with, beyond the fact it would be the biggest buyout in history and Apple shouldn't be doing that at this state. Apple investors have nothing to worry about. how can Disney+ content compete with Oprah, Big Bird and Carpool karaoke? With young kids who love Disney, Pixar, Marvel, Star Wars etc. This is a no brainer for me. Guessing $9.99 in Canada or $100/yr. Take my money, well worth it for the hours my family will watch it. It’s not just Disney that pulling content from Netflix. So is ATT, and Comcast. Between them, that’s Disney, Fox, Warner Bros., and Universal. And to a lesser extent CBS. So that’s pretty much everything anybody wants to watch. All that’s left is Sony and Paramount, and they aren’t exactly driving the box office or TV these days. Netflix will have very little to offer aside from its own original programming, which isn’t much when it all boils down to what’s really worth watching for most subscribers. And Disney will likely end up owning 70% of Hulu, and Comcast might give up their 30% to them before it’s all over. Hulu is going nowhere. Unfortunately Netflix is going to be in a world of hurt trying to retain subscribers as early as next year. They are tens of billions of dollars in debt, and it’s only going to get worse as they throw money at the problem. The only thing keeping them afloat now is their declining DVD rental business, and their subscriber base — which will also start declining as soon as they start losing third party content. And then they’ll be left with nothing but debt and the occasional hit program. Meanwhile, Apple has enough money in the bank to produce top quality programs, like Netflix, and offer it as an added value for customers, along with a TV bundling service with an interface that likely will surpass anything else offered on the market. Apple has a bright future. Netflix should be very worried. This hurts Netflix a lot more than AppleTV+. For one thing, Apple hasn't announced it's price point, while it's clear what Netflix's is...for at least the next six months until they raise prices again. Netflix has NOTHING else to offer, so something like this really hurts them, especially since most of their content that made them popular was Marvel. Apple can afford to not be #1 at the beginning in this market because they have other revenue centers. Netflix has none aside from streaming. You bet Disney knows just how many customers it will have. You're very much the target audience, and it is a great value for your uses. That's cool. I wonder. All the stuff my family would watch (and my kids) we’ve already seen. So why pay just to watch it again? I doubt Disney will put all their catalogue up at once. I bet they rotate titles over the year to keep people subscribed. Otherwise, what’s to stop someone from paying for a single month and watching all the stuff they want and then canceling? All Star Wars and Marvel movies for a single $6.99 “rental fee”? Sign me up. But just for one month. I think you folks are severely under estimating AppleTV+. "The Home of the World's Most Creative Storytellers"
It is New, Fresh and it streams on AppleTV hardware and AppleTV Software Globally and supports Family Sharing. I can understand why it may not make financial sense for Disney to offer their streaming service on AppleTV hardware or AppleTV App but that would still be a disadvantage for them. I think Disney+ will at least be an AppleTV Channel like ESPN, HBO, ShowTime, Starz etc... But with Iger on the board of Apple I would not be surprised to see more special integrations for kids and grownups. Apple’s pay TV service doesn’t appear to have anything but it’s original content. Yes the TV app will have other “channels” integrated but they’re only useful if you have a subscription to them or have an existing cable/satellite subscription. Currently Netflix has non-Netflix original content like: The Office, The West Wing, Good Girls, Shameless, Mad Men, Scandal, Breaking Bad, Twin Peaks, Cheers, The Twilight Zone, Frasier, Andy Giffith Show, Star Trek, Madam Secretary, Blue Bloods, NCIS, Grey’s Anatomy, Glee, Parks and Recreation, Anthony Bourdain Parts Unknown (and I’m sure I’m missing some). I don’t think Apple will be able to charge more than Disney+ if all they have on offer is their original programming. And maybe they don’t care if they think the majority of revenues will come from taking a cut of others subscriptions. This doesn’t hurt Apple assuming Apple expects most of its TV revenues to come from taking a cut of other people’s subscriptions. I’ll be curious to see how may people sign up for stand alone HBO, Showtime etc. subscriptions via the TV app. Are a lot of people doing that via Amazon Prime now? For example, I have the early adopter DirecTV Now package including HBO, Disney Channel, Disney Jr, ESPN, ESPN2, ESPNU, ESPN News etc... so I would not subscribe to these things again but I would subscribe to Disney+ even if it includes on demand versions of the same content. The advantage for Apple is that it wins at all levels/aspects of streaming. 1. The AppleTV hardware with TVOS + SIRI + TV App + AppleTV+ integrates third party content best including CableTV content. 2. Apple gets a cut of streaming some third party content and content like Disney+ amongst others are a definite plus for the hardware. 3. Not sure how the TV App deals go with the TV manufacturers and Roku these deals should overall be a plus for Apple. 4. I suspect that AppleTV+ will be a force to recon with and will lead to more content providers wanting a spot on the AppleTV hardware or TV App. 6. Apple is famous for maintaining and improving their software over time. 8. Apple may package Apple Music with Streaming services. 9. The TV market not just content, is very complex internationally and Apple is well positioned to service the globe. 10. The Apple brand name, security and privacy is top notch. You obviously don’t have kids, or else you’d understand how many times they watch the same movie over and over again. A lot of their classics aren’t even on iTunes or for sale in stores. Interesting how all the discussion is about how this will impact other streamers like Netflix. But Disney has said it will no long license to "3rd parties" -- so I assume that means Disney products will no longer be available on cable bundles -- which could be a severe blow to cable providers such as Comcast. And too, if it is true that Disney products will disappear from those cable bundles, that's going to leave a lot of unhappy cable users. A lot of conjecture based on previous statements. Ultimately, time will tell. Statements can be undone. Contracts broken. New contracts formed, or old contracts redrawn up. I wouldn’t get too worried about anything until we get a few quarterly reports from the major players involved. I have two kids. And I know they used to watch stuff over and over when they were younger. Which they did on regular cable or through PVR. They never came up to me and asked “Hey Daddy, how come all the old Disney classics aren’t on TV?” They simply weren’t aware/didn’t care. Whose kids watch something once? Not mine. I am excited, tbh. Disney is opening the vault so no restrictions on the ‘classic’. Personally, I am more likely to drop Netflix. Without the licensing agreements with Disney that is several hours less spent in the Netflix app. Maybe sign up a month here and there if some hot show is available. We’ll see.